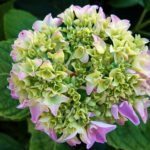 If you grow rhododendrons or hydrangeas, then you are no doubt aware that they thrive in acidic soil. Not every soil will have a suitable pH, however. A soil test can help you determine if your soil has what it takes. If the pH result is below 7, then it is acidic, but if it is 7 or above, it becomes alkaline. There are many remedies for improving the acidity of the soil. One such idea is pouring pickle juice on plants. Yes, it sounds a bit wild. The question being, is pickle juice good for plants? Read on to learn more. Is Pickle Juice Good for Plants? In general, sun-loving plants prefer a neutral soil with a pH of 7. Shade-loving plants like the aforementioned hydrangeas and rhodies prefer a pH of 5.5. As previously stated, a soil test can help you determine if your soil is acidic enough for your acid loving plants. Yellowing leaves may also be a tell-tale sign of overly alkaline soil. So where did the idea of using leftover pickle juice for acid loving plants come from? I’m not sure whose idea to use pickle juice for plant growth was, but it actually has some merit. What are pickles most notorious for? The briny, vinegary flavor, of course. The vinegar is the ingredient in the pickle juice that may be of some use in increasing the acidity of the soil. We already identified that the vinegar contained in the pickle juice is what can help acidify soil, so it seems that using leftover pickle juice can help soil around acid loving plants. Plus, you would be utilizing something that is generally tossed out. There is, however, a down side to every good, and the idea of pickle juice in gardens has just that. Pickle juice also contains a lot of salt, and salt is a desiccant. That is, salt takes the moisture out of things. In the case of root systems, salt begins to dry the plant from within and also decreases the amount of water the plants can take in. The vinegar, too, can be potentially harmful. Vinegar applied directly onto unwanted plants, like weeds, will kill them. So how can you use pickle juice to improve plant growth then? The secret is in the application and the dilution of the pickle juice. Pickle juice will vary in the amount of ingredients from manufacturer to manufacturer. To protect the plant, the safe thing to do is dilute the juice – use 1 part juice to 20 or even more parts water. Also, never apply the solution directly to the plant foliage, for that matter, not to the root zone either. Ideally, if you don’t want to waste that pickle juice, instead of pouring the pickle juice on the plants, dump it on the compost pile. Let it decompose with the food scraps, coffee grounds and plant detritus. Then once per season, add the compost to the soil surrounding your acid loving plants. In this manner, you are using pickle juice to enhance the health of the plants, albeit in a roundabout way with no danger to their root system of foliage.